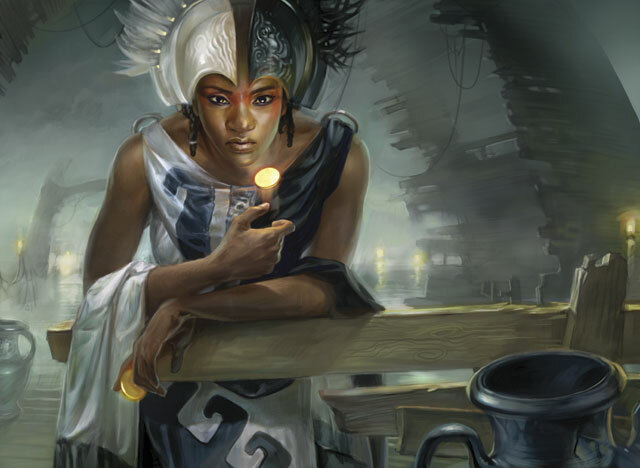 Last week I wrote about rremedio1's Mumm-Ra decklist that took top spots in recent Standard Pauper Player Run Events. I liked the deck so much that I decided to play it in this week's Monday Pauper Deck Challenge, and I managed to pilot it to a 2nd place finish. My MVP for the event was most definitely Scholar of Athreos. Honestly, I had never given much credence to this card. It's a White Horned Turtle with an off-color ability that is pretty expensive for merely draining your opponent for 1 life. However, I would contend that the metagame is at a spot, once again, where Lifegain is surprisingly good. If you're playing Aggro, having the higher life total usually means you win the race. And if you're playing Control, having the higher life total means that you have more opportunity to utilize the card advantage you're generating. Scholar of Athreos is perfect for the latter. In the early to mid game, spending 2B to steal a point of life from your opponent is pretty meager, since for that same cost you could be drawing 2 cards, removing a creature, or playing a decent threat. But in the late game, where both players are top-decking or when your struggling to eke out one last turn to stabilize, being able to activate the Scholar multiple times can completely change the game. But as good as this card is, I believe that only playing one might still be correct. The card is not ideal in multiples, and since you don't need to play it until the late game, your opponent is unlikely to have as much removal left to get rid of it. Against a more aggressive build it does have some utility as a 3 mana 1/4, but even there you probably have better options. And at least in this list, you won't typically have access to White very early, so playing multiples just means they're more likely to be stuck in your hand. Later this week I'll be submitting a full decklist article and video replay over at PureMTGO on this deck. More on that to come. Let me also mention that MagicGatheringStrat has announced their fourth community league, this time using the Standard Silverblack format, which includes all Commons and Uncommons in the current Standard set. It should be a great event, and with the Standard Pauper Sealed League wrapping up, the timing couldn't be better. Check out all the details, and signup today! Also, I've loved scholar since he was spoiled. Isn't it "Athreos", though? What Are the Best Uncommons in Standard?